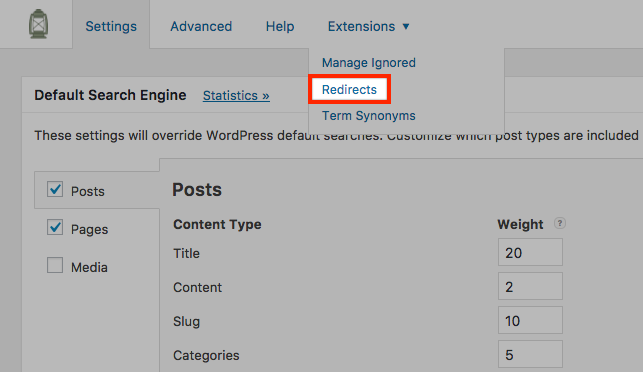 Automatically redirect to a specific page when certain searches are performed! While SearchWP will find the most relevant search results for you, there are times where you simply want to help your visitor move directly to a page of your choosing, saving them a click in the process. Clicking through to the Redirects settings screen, you’re given full control over how Redirects should automatically guide your visitors depending on search query. You can add as many Redirects as you’d like, they’re put in place as soon as you save the settings! That means that either your theme or an active plugin has sent output to the browser before Redirects could handle the request. If you are using a supplemental engine please try editing your supplemental engine template so that your call to get_header() occurs after your SearchWP logic. If that doesn’t work, please open a support ticket.